I had a lovely Sunday with my friend April last weekend, visiting Lustre and Handmade Nottingham, two excellent craft fairs in Nottingham. The world of craft fairs is varied, from small fairs held at church halls and community centres, through markets by local craft makers and artists to high end events featuring nationally recognised makers. I love the variation of work on display but most or all, I love the people. I really enjoy talking to other makers who are passionate and enthusiastic about their products and genuinely want to meet the people who buy them. As a maker myself, I love seeing people being drawn to my jewellery and asking me about it. With the tagline of ‘Beautiful things for you and your home’, Lustre is a high end, contemporary fair held at Lakeside, the University of Nottingham’s Arts Venue. There is an entry fee of £5 and you get a wrist tag and a beautiful booklet, so it immediately feels like something special. We headed into the Djanogly building first, where they use the theatre space. The downside of this wonderful performance space, is that the low level theatre lighting, with bright spotlights isn’t that conducive to looking at craft, or for taking photographs! That being said, there was some lovely work on display. Two jewellers in particular caught my eye. Libby Ward uses electroplating and some unusual materials to create highly textured and organic pieces that are still very wearable. Amy Leigh combines free-form cast pewter with clear resin and silver into sculptural jewellery that really catches the eye. Her process is fascinating! The lovely ceramics by Julia Smith are whimsical and just have such a lovely feel to them; I can imagine them being used and cherished. On the opposite end of the scale is Michaela McMillan. Her sculptural objects are a delightful combination of kitsch and museum artifact. The detail that goes into the embellishment and story of each piece is fascinating! Moving over to the Weston Gallery, (where the lighting is drastically improved! ), I found some wonderful ceramic and enamel work. Hayley Sutcliffe‘s delicate enameled forms have delightful surface pattern. Foto Ceramica appeals to my love of lo-fi photography, exposing textural images directly onto ceramics. Ann Povey is an artist that combines found objects with ceramics, glass and metalwork. The amalgamation of industrial tools and delicate ceramic really grabbed my attention. One of my favourite designers was Alasdair Nelson. His porcelain vessels contain pools of lush glaze that I could gaze into for hours! I’m not normally one for glass, but two makers stood out for me. The hanging, hand blown vessels made by Maggie Williams are reminiscent of pitcher plants, yet in such delicate pastel shades. The colourful vases by Thomas Petit were joyful, classic and just made me smile. One of the things I love about Lustre is that it blurs the lines between art and craft, something I have been fascinated by since my Fine Art degree. In fact, I wrote my dissertation on the subject! I therefore view Lustre in much the same way I would an art exhibition, looking at beautiful and fascinating things, which is is only compounded by the venue being an arts centre. In contrast, the Malt Cross, where the Handmade Nottingham Winter fair was being held, is a cafe bar. A very nice cafe bar, with workshop space, a gallery and an adjoining craft shop, but still ultimately a pub. This is an important distinction, because it is an environment that most people feel comfortable in. Whereas I recognise that not everyone would feel comfortable or consider going to an event held at a theatre or art gallery. The Handmade Nottingham Winter craft fair might have been a smaller event, but it was full of wonderfully fun and imaginative work. Its really nice to a see a mix of new faces and established makers. Everything was great quality, and well designed, but my favourites were Elouise Makes and her beautiful animal jewellery- obviously I love her cat pendants, but her Polar range is just brilliant too! Wren and Wilson make quirky jewellery that has a lovely illustrative quality to it that I really like. Stupidcats has a cast of feline characters that grace her work, all with a unique look and personality, and Baum knits hand dyed yarns and knitted items were just awesome. Special mention to Joyful and Mellow whose alcoholic jams were utterly delicious. Some people I know *might* be getting some for Christmas…..if I don’t eat it first! I mean, Prosecco and Strawberry jam? Er yes! One lovely touch was the 10 min portraits by Jo of Hello Sunshine. Also, checkout to Jo’s cat dungarees. 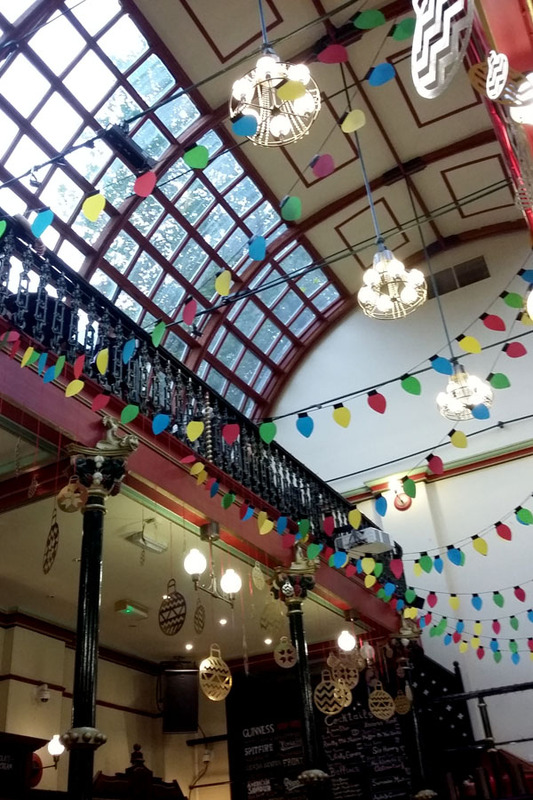 It is little touches like this and the amazing decorations they put up that set events like Handmade Nottingham markets apart and makes them special. There is a reason that Etsy, the online marketplace for handmade items now holds bricks and mortar Etsy Made Local fairs in cities across the world every year; people love seeing, touching and in some cases tasting and smelling handmade products and meeting the person who made them. How often does that happen anymore; actually being able to buy a handmade product from the person who made it? I am totally accepting of the commercial world that we live in and that most things I buy will be made by machine by several different people, plus a few robots and computers, far away in another country. But to buy an item that has been made by hands, by one skilled person somewhere relatively local to you still has an immense pull. And thats why I love visiting craft fairs, no matter where on the scale they fall. From the grandmother selling her crochet to the professional goldsmith. There are events like Lustre and Handmade Nottingham all around the UK. Go and find them and support local makers, chat to them about their work and be part a wonderful movement and buy handmade! If you went to either event, or went to a similar one in your town or city, I would love to hear about it! Feel free to comment below or message me on Twitter, Instagram or Facebook!